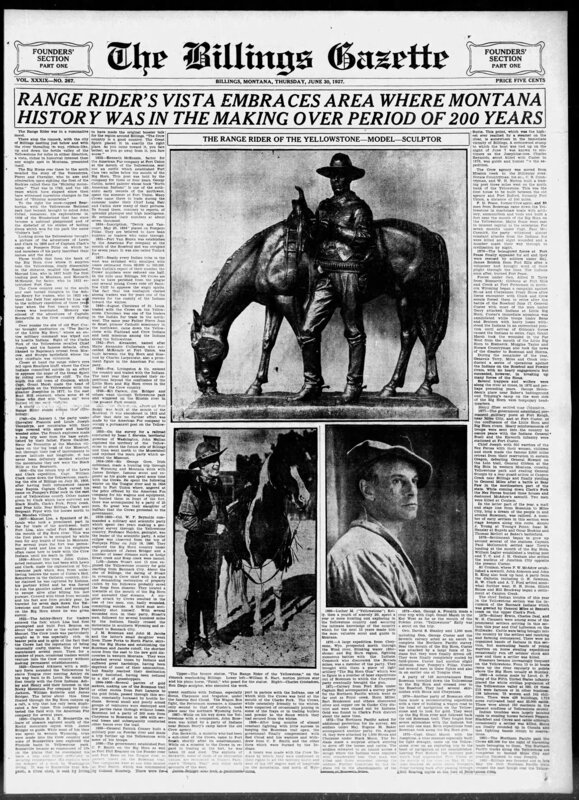 SCVHistory.com | William S. Hart Mobbed by Fans, Honored by Sioux on Little Bighorn Anniversary, Billings & Crow Agency, 1926.
at Little Bighorn Anniversary Events. June 1926 | News Reports. Bill Hart, Hero, Swaps Emotion With Billings. Film Actor Finds Self Town Idol When N.P. Train Lands Him and Chief Standing Bear. The Billings (Montana) Gazette | Thursday, June 24, 1926. West really met west. Wednesday night when Bill Hart, hero of millions of movie fans, arrived in Billings at 6:55 o'clock from the Pacific coast. Citizens here, from the kids to the old folks, literally jammed the union station to get a glimpse of their idol. Fully an hour before train time, the crowd began to gather, and it was a throng composed of men and women, girls and boys and tiny tots. Commotion and emotion ran high when the Northern Pacific drew slowly into the depot, and excited groups ran to this and to that end of the station. Where would he get off the train? That was the question. The getting-off was simple enough. From the middle section there stepped a large man in a dark gray suit and a large Stetson hat, around the brim of which were several strands of white cord, ending in a pretty tassel. "It is he!' the crowd cried, and straightway the throng gathered about the man who, time and again, has thrilled them in a way which only few western characters have thrilled them. He was followed immediately by Chief Standing Bear, a Sioux, and a close friend. And not to be outdone by the big folks, the little fellows, some of whom were dressed especially in western garb, pressed close to Hart. Hands, dozens of them, were thrust out. And the hero of it all sincerely grasped them and extended his heartfelt greetings. Hart and Standing Bear were crushed through the many curiosity seekers to a waiting auto, furnished by local movie men, and taken to his room in the Northern hotel. Even at the hotel, there was a large crowd who eagerly waited for the movie actor, who found trouble in working his way to the desk to register. After remaining in his rooms in the Northern, Mr. Hart and Chief Bear, after visiting friends, and talking over the movie business with local men, and after old times were recalled by Dave Barry, of Superior, Wis., a close friend of Mr. Hart, the two were taken to the Babcock theater, where both gave brief addresses. Following the theater attendance, both went to the Moose dance at the Airdome, where Mr. Hart served as one of the judges in the bathing beauty contest. Thereafter, they retired, and in the morning were to be taken to the site of the battlefield by Charles M. Bair of Billings. Billings was literally agog at the arrival of Mr. Hart, said to be the only independent movie producer. Looking at that big man, that supposedly rough exterior, and recalling the various rough deeds in which he has engaged on the silver sheet, one would not gather his breast was wrung with strong emotion at the ordinary process of getting off a train and meeting, at most, several hundred people. Yet such was the case, and here are Mr. Hart's exact words in an interview which he gave. "It made my heart swell with high emotion and a lump came into my throat, and some tears ran down my cheeks when I arrived, and when I saw that wonderful crowd of westerners and the good townsmen of Billings. "I only hope that in my conduct as a private citizen and in my role as a professional actor that I may live up to the faith which my good friends here have put in me." And when Mr. Hart said those words, in a private room in the Northern hotel in which there were only himself and the reporter — a short respite got from the pressing multitude who wanted to see him — it was apparent that he meant them. He walked about the room, clutched his hands about him, strode again and again the floor, and his voice quaked with a sincerity which he really puts into his plays on the sheet. Youths Greet Him at Hotel. It was the Hart, unmasked, the man who really understands the west, loves it, as he said at the Babcock theater, loves it as the gull loves the sea and the eagle the sun. His heart, he told the big Babcock theater audience, which had come especially to see and hear him, was laid low on the ground by his visit here, and his intended visit to the site of the centennial celebration of the fiftieth anniversary of the battle of the Little Big Horn. Following Mr. Hart's descent from his rooms in the Northern hotel, the time just before his entrance into the Babcock, a throng of youths awaited at the hotel entrance. When he came out his identity was immediately known. At once he was subjected to handclasping, pats on the back, and all sorts of hurrahs, huzzas and welcomes. He took them all in good faith, warmly, and responded in a fine fashion. "Tumbleweeds," Hart's latest picture, it was learned Wednesday night, will be shown at Crow Agency during the battle anniversary. Movie men who conferred with Hart in his room at the hotel included E.P. White of the Strand theater at Livingston; Walter S. Hand, sales manager of the United Artists corporation; Rolla Duncan and Eugene O'Keefe of the Babcock theater, and Charles M. Bair. 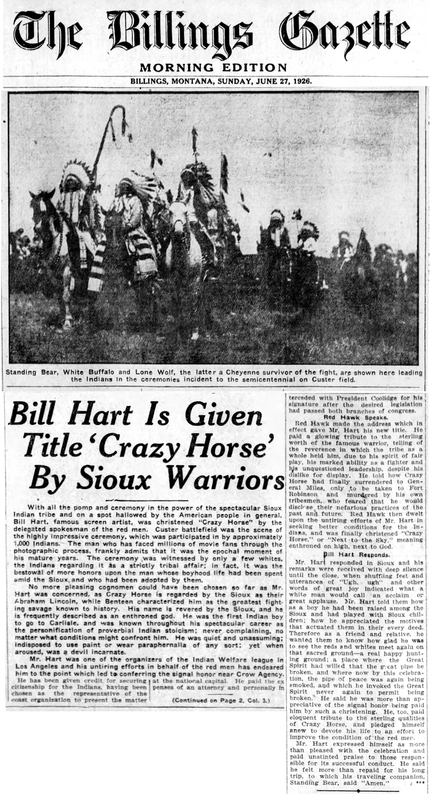 Bill Hart is Given Title 'Crazy Horse' by Sioux Warriors. 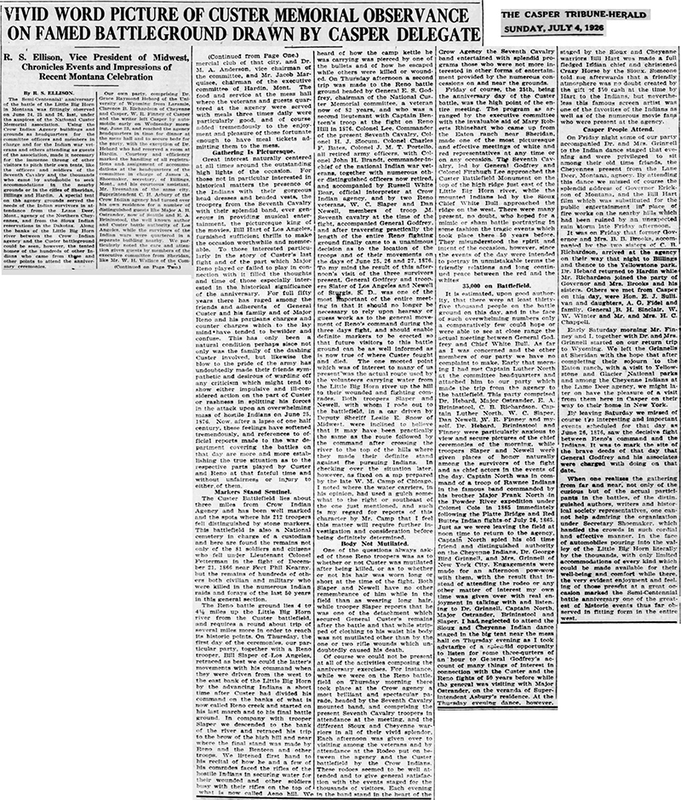 The Billings Gazette, Morning Edition | Sunday, June 27, 1926. With all the pomp and ceremony in the power of the spectacular Sioux Indian tribe and on a spot hallowed by the American people in general, Bill Hart, famous screen artist, was christened "Crazy Horse" by the delegated spokesman of the red men. Custer battlefield was the scene of the highly impressive ceremony, which was participated in by approximately 1,000 Indians. The man who has faced millions of movie fans through the photographic process frankly admits that it was the epochal moment of his mature years. The ceremony was witnessed by only a few whites, the Indians regarding it as a strictly tribal affair; in fact, it was the bestowal of more honors upon the man whose boyhood life had been spent amid the Sioux and who had been adopted by them. 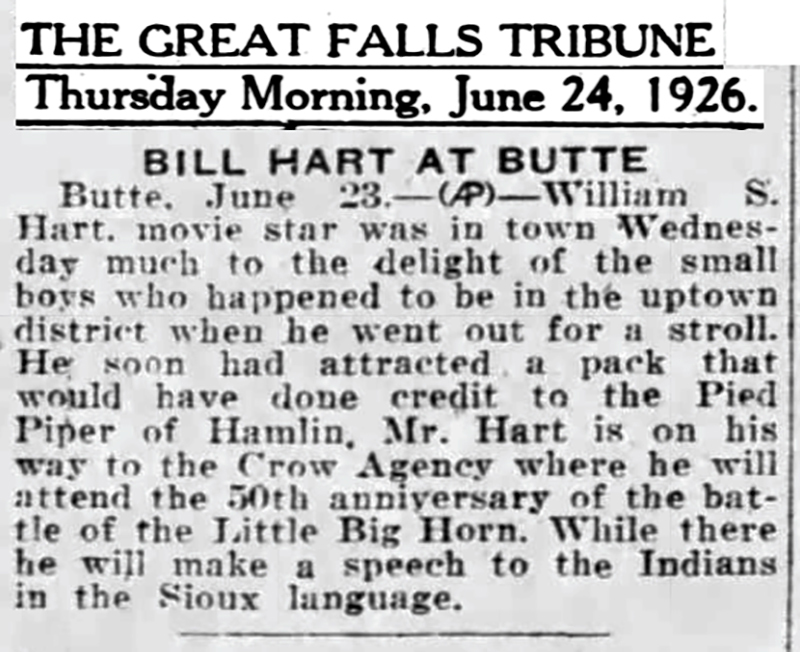 Mr. Hart responded in Sioux and his remarks were received with deep silence until the close, when shuffling feet and utterances of "Ugh, ugh" and other words of great joy indicated what a white man would call an acclaim or great applause. Mr. Hart told them how as a boy he had been raised among the Sioux and had played with Sioux children; how he appreciated the motives that actuated them in their every deed. Therefore as a friend and relative, he wanted them to know how glad he was to see the reds and whites meet again on that sacred ground — a real happy hunting ground; a place where the Great Spirit had willed that the great pipe be broken, and where now by this celebration, the pipe of peace was again being smoked, and which he invoked the Great Spirit never again to permit being broken. He said he was more than appreciative of the signal honor being paid him by such a christening. He, too, paid eloquent tribute to the sterling qualities of Crazy Horse, and pledged himself anew to devote his life to an effort to improve the condition of the red men. Mr. Hart expressed himself as more than pleased with the celebration and paid unstinted praise to those responsible for its successful conduct. He said he felt more than repaid for his long trip, to which his traveling companion, Standing Bear, said "Amen."